Global Resources Outlook 2019, prepared by the International Resource Panel, examines the trends in natural resources and their corresponding consumption patterns since the 1970s to support policymakers in strategic decision-making and transitioning to a sustainable economy. Over the past five decades, the population has doubled and global domestic product has increased four times. The report finds that, in the same period, annual global extraction of materials grew from 27 billion tonnes to 92 billion tonnes (by 2017). This will double again by 2060 on current trends. According to the report, “the extraction and processing of materials, fuels and food make up about half of total global greenhouse gas emissions and more than 90 per cent of biodiversity loss and water stress”. By 2010, land-use changes had caused a loss of global species of approximately 11 per cent. Since 2000, growth in extraction rates have accelerated to 3.2 per cent per annum, driven largely by major investments in infrastructure and higher material living standards in developing and transitioning countries, especially in Asia. However, the wealthiest countries still needed 9.8 tons of materials per person in 2017, mobilized from elsewhere in the world, which is also driving this trend. More specifically, the use of metal ores increased by 2.7 per cent annually and the associated impacts on human health and climate change doubled during 2000-2015. Fossil fuel usage went from 6 billion tonnes in 1970 to 15 billion tons in 2017. Biomass increased from 9 billion tonnes to 24 billion tonnes – mostly for food, feedstock and energy. By using data from historical trends, the report projects into the year 2060. From 2015-2060, natural resource use is expected to grow by 110 per cent, leading to a reduction of forests by over 10 per cent and a reduction of other habitats like grasslands by around 20 per cent. The implications for climate change are severe, as there would be an increase in greenhouse gas emissions of 43 per cent. The report says that if economic and consumption growth continue at current rates, far greater efforts will be required to ensure positive economic growth does not cause negative environmental impacts. “Modelling undertaken by the International Resource Panel shows that with the right resource efficiency and sustainable consumption and production policies in place, by 2060 growth in global resource use can slow by 25 per cent, global domestic product could grow 8 per cent – especially for low- and middle-income nations – and greenhouse gas emissions could be cut by 90 per cent compared with projections for continuing along historical trends,” the Co-Chairs of the Panel, Izabella Teixeira and Janez Potočnik, wrote in the joint preface to the report. A year on from merging with UTZ, the Rainforest Alliance is devising a single new certification programme to be launched at the end of 2019. As part of their unification, the Rainforest Alliance has launched a new corporate identity. Fairtrade International has joined the International Cocoa Initiative (ICI) as a Non-Profit Contributing Partner. The partnership will allow the two organisations to improve their existing operating models and reach more children and their families in cocoa communities in Côte d’Ivoire and Ghana to achieve a shared goal of eliminating child labour and enabling child protection. GOTS is the stringent voluntary global standard for the entire post-harvest processing (including spinning, knitting, weaving, dyeing and manufacturing) of apparel and home textiles made with certified organic fibre (such as organic cotton and organic wool), and includes both environmental and social criteria. Key provisions include a ban on the use of genetically modified organisms (GMOs), highly hazardous chemicals (such as azo dyes and formaldehyde), and child labour, while requiring strong social compliance management systems and strict waste water treatment practices. 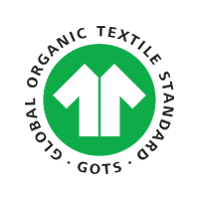 GOTS was developed by leading international standard setters - Organic Trade Association (U.S.), Japan Organic Cotton Association, International Association Natural Textile Industry (Germany), and Soil Association (UK) to define globally-recognised requirements that ensure the organic status of textiles, from field to finished product. GOTS is a non-profit organisation which is self-financed. For more information please see www.global-standard.org. 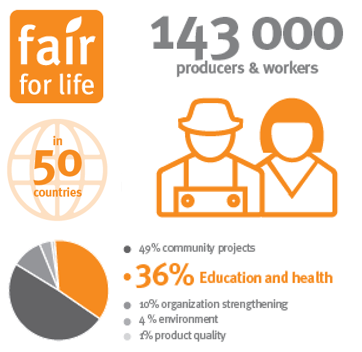 Fair for Life label certifies more than 143,000 producers and workers, contributing 36% of a development fund to local health and education projects. In Côte d’Ivoire, the Maraouhé park is one of the last remaining wild forests, a sanctuary for the last 200 to 400 elephants in the country. This forest is however threatened by cocoa. Illegal growers cut old trees and replace them with cocoa trees, as the RTS (French-speaking Swiss television company) was able to verify on the spot. Once in the warehouses of local cooperatives, the beans are mixed with cocoa from other plantations. Traceability is lost. These bags with mixed cocoa are resold as UTZ cocoa and end up in a regional headquarters of Cargill. Local Cargill employees explained to the RTS that the cocoa is resold to Nestlé and exported to Europe. Read François Ruchti's article and watch the RTS report. One of the objectives of the Belgian "Beyond Chocolate" partnership is to achieve a "living income" for cocoa producers by 2030. Here are the latest studies on living income for cocoa producers in Ivory Coast and Ghana. The Living Income Community of Practice calculates ‘Living Income’ Benchmarks for the cocoa producing regions in Ghana and Côte d’Ivoire. The Living Income Benchmark studies estimate the net income required for a decent standard of living for a typical family in these regions. The study “Analysis of the income gap of cocoa producing households in Ghana” (KIT) estimates a Living Income Benchmark in rural cocoa growing areas of Ghana to be GHS 21,100 (USD 4,742) per year for a typical male-headed household (up to 4 ha of productive land) of 3.5 adults and 2.5 children. Female-headed households of 3 adults and 2 children have a Benchmark of GHS 17,806 (USD 4,001) per year. Male-headed households with large land size (more than 4 ha of productive land) composed of 3.5 adults and 3 children have a Benchmark of GHS 22,799 (USD 5,123) per year. The study “Living Income Report Rural Ghana” (University of Ghana) estimates a Living Income in rural cocoa growing areas of Ghana (Ashanti, Central, Eastern, and Western Regions) to be GHS 1,464 ($329) per month for a typical family of two adults and three children. The study “Analysis of the income gap of cocoa producing households in Côte d’Ivoire” (KIT) estimates a Living Income Benchmark in rural cocoa growing areas of Côte d’Ivoire to be CFA 3,759,281 (USD 6,517) per year for a typical male-headed household (up to 4 ha of productive land) of 3.5 adults and 3.5 children. The study “Living Income Report Rural Côte d’Ivoire” (CIRES) estimate a Living Income in rural cocoa growing regions of Côte d’Ivoire (Gôh, Loh Djiboua, Nawa, Mé, Agnéby, Tonkpi, Indénié-Djuablin, Sud-Comoé and San-Pedro) to be CFA 262,056 ($454) per month for a typical family of two adults and four children. Earlier, in April 2018, True Price and Fairtrade published a study that estimates a living income for a typical 8-member household in Côte d’Ivoire to be USD 7,318 per year. Having defined living incomes, strategies to close the income gap for smallholder farmers (Côte d’Ivoire and Indonesia) are needed. This piece of research has been conducted by AidEnvironment on behalf of the Living Income Community of Practice. The Fair Trade Advocacy Office (FTAO) has launched a report shedding light on the changing nature of competition law and showing where it is currently obstructing sustainability in food systems. The authors give recommendations how to mend the broken links between EU competition law and sustainability to support overreaching policy goals such as the Sustainable Development Goals (SDGs) or climate commitments. The question of whether and to what extent EU competition law can be a tool for sustainability had already been controversially discussed well before the Bayer-Monsanto merger. But this debate is about to be accelerate amidst Germany’s recent announcement to seeking revision of European competition law in their 2020 presidency following the prohibition of the merger between Siemens and Alstom. FTAO welcomes that the recent European Parliament Resolution of 31 January 2019 on the Annual Report on Competition Policy by the European Commission already made strong references to sustainability. the social foundations of our society. FTAO commissioned the report “EU Competition Law and Sustainability in Food Systems: Addressing the Broken Links” to investigate the broken links between competition law and sustainability. The authors of the report, Dr Tomaso Ferrando (University of Bristol Law School) and Dr Claudio Lombardi (KIMEP University), make a strong case that EU competition law cannot be viewed in isolation but needs to be applied in conjunction with other EU laws, principles, and objectives. For EU competition law to support -or at least not obstruct- the achievement of the Sustainable Development Goals (SDGs) and the social and environmental commitments in the EU Treaties, the report suggests interpretative, institutional and regulatory changes to the current EU competition framework. For example, EU competition law should not prevent a sector commitment to paying a living wage to farmers in the global south who are selling agricultural products into the EU market. The full report and a briefing note can be found here. The year 2017 was another record year for global organic agriculture. According to the latest FiBL survey on organic agriculture worldwide, the organic farmland increased substantially, and the number of organic producers and organic retail sales also continued to grow, reaching another all-time high, as shown by the data from 181 countries (data as of the end 2017). The 20th edition of the study “The World of Organic Agriculture” published by FiBL and IFOAM – Organics International shows a continuation of the positive trend seen in the past years. The market research company Ecovia Intelligence estimates that the global market for organic food reached 97 billion US dollars in 2017 (approx. 90 billion euros). The United States is the leading market with 40 billion euros, followed by Germany (10 billion euros), France (7.9 billion euros), and China (7.6 billion euros). In 2017, many major markets continued to show double-digit growth rates, and the French organic market grew by 18 percent. The Swiss spent the most on organic food (288 Euros per capita in 2017). Denmark had the highest organic market share (13.3 percent of the total food market). In 2017, 2.9 million organic producers were reported, which is 5 percent more than in 2016. India continues to be the country with the highest number of producers (835’200), followed by Uganda (210’352), and Mexico (210’000). A total of 69.8 million hectares were organically managed at the end of 2017, representing a growth of 20 percent or 11.7 million hectares over 2016, the largest growth ever recorded. Australia has the largest organic agricultural area (35.6 million hectares), followed by Argentina (3.4 million hectares), and China (3 million hectares). Due to the large area increase in Australia, half of the global organic agricultural land is now in Oceania (35.9 million hectares). Europe has the second largest area (21 percent; 14.6 million hectares), followed by Latin America (11.5 percent; 8 million hectares). The organic area increased in all continents. Globally, 1.4 percent of the farmland is organic. However, many countries have far higher shares. The countries with the largest organic share of their total farmland are Liechtenstein (37.9 percent), Samoa (37.6 percent), and Austria (24 percent). In fourteen countries, 10 percent or more of all agricultural land is organic. The production process that turns the cocoa bean into a chocolate bar requires many intermediary steps and involves multinational corporations. More and more chocolatiers all over the world now want to take the whole process in their own hands. Their raw material of choice is not liquid factory-supplied ‘couverture chocolate’ delivered in large cisterns, but cocoa beans which they personally select in the South. This growing group of artisanal chocolatiers – known as the bean-to-bar movement – resolutely targets quality rather than mass production and looks for top-range beans with exquisite flavours. Their work mostly results in a good relationship with cocoa growers and fair pay for the growers’ tough labour. The Trade for Development Center carries out various programs aimed at improving market access for SMEs and producer organizations in developing countries, as well as promoting fair and sustainable trade. Fair wages for farm labourers ?